The basic experimental approaches for two studies for X-linked neurodegenerative disorders — myotubular myopathy and infantile spasms syndrome — have therapeutic potential for different reasons. Dramatic results in animal models of two X-linked neurologic diseases will likely lead quickly to clinical trials in children with myotubular myopathy and infantile spasms syndrome. The animal studies used different therapeutic approaches and attempted to correct different neurologic deficits, but had one thing in common: short-term treatment led to lasting and profound improvements in a grave phenotype. “Never in a million years” did Martin Childers, DO, PhD, expect that a single dose of adeno-associated virus (AAV) carrying the gene for myotubularin would lead to the sustained, virtually complete correction of disease, in both mouse and canine models of myotubular myopathy (MTM). MTM is an X-linked non-degenerative myopathy caused by loss of function of the myotubularin 1 gene, an enzyme important for maintenance of the network of t-tubules, critical for coupling excitation to contraction of muscle. It is estimated to affect 1 in 50,000 boys, and has an extremely grave prognosis, with high early mortality and rare survival past the first several years of life. For the study reported in the Jan. 22 issue of Science Translational Medicine, Dr. Childers and colleagues injected mice lacking the MTM1 gene with a single dose of AAV-8 (a muscle-specific serotype) carrying the murine form of the gene. Injection at three weeks, at the onset of pathology, conferred almost complete protection against disease, through the end of observations at six months, accompanied by correction of muscle pathology. Injection at five weeks, when untreated mice were severely affected and 20 percent had died, led to restoration of body mass, improved muscle function, and prolonged survival in almost all animals. The response was seen even in animals with relatively low levels of protein expression. “Apparently, a little goes a long way,” Dr. Childers said, who is professor of rehabilitation medicine at the University of Washington in Seattle. Next the authors turned to a canine model of MTM, discovered only recently. Dr. Childers gives great credit to Alison Frase, a parent of a child with MTM, who tracked down a family whose Labrador retriever had male pups with suggestive symptoms. With the family's encouragement, “she flew from Florida to Saskatchewan with an empty dog crate,” and came home with the founder of what is now a growing colony of dogs being used in MTM research. Here, they used the same AAV vector to inject the canine MTM1 gene into a hind limb muscle at 10 weeks of age, at the time the dogs became symptomatic. Within six weeks, the injected muscle had grown to be 50 percent larger than the noninjected contralateral muscle, and had improved muscle architecture at both the cellular and subcellular levels. In a second experiment, three dogs received a single dose injected into the saphenous vein, leading to improved strength in both the injected and contralateral limb, and normalized respiratory function, without any signs of immune reaction, suggesting that systemic delivery can be done safely, and can be effective. “Most importantly,” Dr. Childers said, “all treated dogs showed a marked improvement in survival,” living for many months past the time when untreated littermates had died. One was sacrificed for study after 14 months, while the other two remain alive, “ambulant and clinically robust” more than a year after treatment. Audentes Therapeutics is developing the therapy for clinical trials. Matthew Patterson, the company's chief executive officer, told Neurology Today that these results are robust enough to drive the preclinical program to a quick end. Pending federal approval, “our goal is to begin clinical trials in 2015,” he said. X-linked infantile spasms syndrome (ISSX) is one of the most serious forms of childhood epilepsy, characterized by sudden muscle spasms and typically followed by intractable epileptic seizures and cognitive dysfunction. It is caused by mutation in the Aristaless-related homeobox (ARX) gene, a neurodevelopmental transcription factor that controls migration and maturation of interneurons. In mice, a critical window for neuronal migration and positioning in the cortex occurs between embryonic day 9 and postnatal day 10. In male brains, this interval overlaps with a surge in the estrogen hormone, 17 beta-estradiol (E2), according to Jeffrey Noebels, MD, PhD, professor of neurology, neuroscience, and molecular and human genetics at Baylor College of Medicine in Houston. That led Dr. Noebels to ask whether supplemental E2 might overcome some of the problems caused by loss of function of the ARX gene, a proposition he tested in a mouse model of the disease carrying the same mutation and displaying similarly severe seizures and spasms. For the study, also reported in the Jan. 22 issue of Science Translational Medicine, male newborn mice were treated with daily subcutaneous injections of E2 between postnatal days 3 and 10, or between days 33 and 40, and then were monitored by video electroencephalography. Mice treated early, but not those treated late, significantly improved, with a two-thirds reduction in abnormal cortical discharges, and a reduction in seizures, with most mice remaining seizure-free over a three-week observation period. While one third of untreated mice developed spasms, no early-treated mice did. Late treatment had no effect. The results “suggest that E2's protective effect depends on exposure during a critical developmental period,” said Dr. Noebels. Estrogen receptor agonists also exerted a positive effect when administered early. The critical period for E2's effect coincides with the later stages of maturation of cortical interneurons. Dr. Noebels found that early treatment improved density across cortical layers of two interneuronal subtypes, those displaying neuropeptide Y and calbindin, without altering the density of parvalbumin neurons, which are not affected in the disease model. Cholinergic interneurons were also restored to normal. In as much as dysfunction of these neurons are implicated in spasms, this restoration may explain the reduction in spasms seen in the mice. Accompanying these cellular changes, Dr. Noebels found that treatment altered messenger RNA levels of several targets of ARX, in one case up to 92 percent of the wild-type levels. Much remains to be learned about the effects of the ARX mutation, and E2's ability to mitigate the damage it does. While much of ARX's activity occurs prior to birth, presumably some of its effects occur postnatally, accounting for the effects of E2 therapy. Commenting on the study, Jong Rho, MD, professor of pediatrics and clinical neurosciences at the University of Calgary, Canada, said “the compelling results from this study could certainly provide a scientific basis for a clinical trial,” although he recommends further validation in other models, to determine whether non-ARX ISS could also benefit. •. Childers MK, Joubert R, Poulard K, et al. Gene therapy prolongs survival and restores function in murine and canine models of myotubular myopathy. Sci Transl Med 2014;6(220):220ra10. •. Olivetti PR, Maheshwari A, Noebels JL. Neonatal estradiol stimulation prevents epilepsy in arx model of x-linked infantile spasms syndrome. Sci Transl Med 2014;6(220):220ra12. 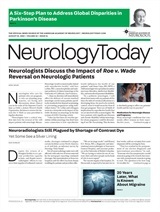 Neurology Today14(5):10-11, March 6, 2014.